Upstairs laundry room: Having your laundry room near your bedrooms will cut down on the time it takes to transport loads of clothing and put them away. Open great room: Being able to keep an eye on the little ones playing while you prepare meals can give you peace of mind. Bedroom layout: While later in life you may want a secluded master suite, parents of very young children may prefer to keep them close for midnight feedings and check-ins. Walk-in pantry: Buying in bulk from a buyer’s club store? Make sure you have the space to house your big boxes of breakfast cereal and baby formula. Whether you have people over for the game every weekend or frequent dinner parties, you’ll want to make sure your new home can accommodate those gatherings comfortably, rain or shine. Open kitchen: If you entertain a lot, you don’t want to be stuck away in a kitchen preparing food while everyone else mixes and mingles. A kitchen that opens into a great room will allow you to be part of the conversation without burning the soufflé. Butler’s pantry: A butler’s pantry is a must for the serious entertainer. You can use it to set out a large buffet. Plus, the cabinets are the perfect storage spot for platters and extra wine glasses. Indoor/outdoor options: Host a lot of barbeques or summer parties? Make sure the flow from your great room to the outdoors is seamless. An extended patio may be in order! Multi-slide patio doors will even let you open up the entire wall to let the outdoors in. Are your adult parents or college-age kids living with you? What you are looking for in a floor plan at this time in your life may differ tremendously from just a few years earlier. Check out these exciting features! Separate guest suite: Many floor plans offer a separate suite on the main level with a private entrance, bathroom and laundry facilities. These provide the privacy of a separate living area conveniently under the same roof. Main-floor master suite: If you’re living with an older parent who needs privacy, a home with two master suites is another great option. Look for floor plans with a master suite on both the main and second floors. Private bedroom layout: Even if the home you love doesn’t have two master suites, consider a layout with the master suite located in a separate area from the other bedrooms, providing privacy for every generation in the house! Don’t see your lifestyle mentioned above? No problem. 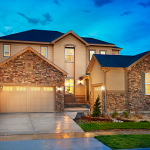 Make a list of priorities and browse the floor plans at RichmondAmerican.com to search for features that are right for you. AND GET OUR FREE GUIDE!